A new lawsuit aimed at Home Depot claims the company engaged in shakedown tactics to pressure and intimidate thousands of customers, accused of shoplifting, into paying millions of dollars to have those accusations dropped. The class-action suit says Home Depot would threaten customers with a lawsuit if they didn’t pay up, even when they had no intention of actually suing anyone. The complaint filed in a California Superior Court alleges that Home Depot twisted the state’s Civil Shopping Law as a way of turning itself into a “profit center,” using “damages” it wrangled from accused customers to create a tidy cash pile. In one example given in the complaint, as reported by ABC News, two customers were shopping at a Home Depot in June, and each used a pair of $3.99 work gloves to help in loading lumber onto their cart. Before the cashier rung up the purchase, one of the men put the gloves on top of the merchandise in the cart, on the top. But he says the checkout personnel didn’t scan the gloves. After he’d paid for his purchase of over $1,000 in wood but before he exited, the complaint states that a Home Depot security guard came up to him from behind and informed him he hadn’t paid for the two pairs of gloves. Both men were taken into custody. The lawsuit claims the accused shoplifters were told they could leave only if they handed over personal identification information and signed a document that promised they’d stay out of the store for 90 days, so they did. Upon leaving, each received a copy of something called a “Notice of Intent to Exercise the Rights and Potential Remedies of Home Depot.” Neither one was arrested, and police were never called, the complaint says. But in the notice was a warning: “You may face both criminal charges and a civil claim related to this incident.” It also said Home Depot’s attorneys would be contacting them with more information “regarding demand for the civil penalty.” If they didn’t respond, they could be on the hook for even more, the document allegedly said. He didn’t reply, and thus says he received another letter demanding $625, and again the threat of a lawsuit. Furthermore, points out the attorney, in four years, Home Depot hasn’t sued a single person under California’s anti-shoplifting law, which says merchants can recover the cost of stolen items (in this case, umm, $3.99, not hundreds). 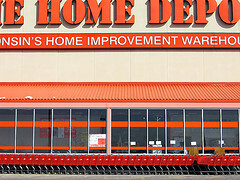 Home Depot’s law firm also hadn’t sued any Home Depot customers accused of shoplifting. The class-action lawsuit argues that Home Depot and its lawyers are betting on the fact that plenty of people will be terrified enough by the demand letters and will pay up instead of facing a lawsuit. A lawsuit which, in all likelihood, would never happen due to the expense of suing. *Thanks for the tip, Dave!